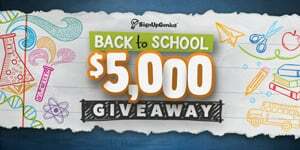 Schools are overflowing with genius every day — so we want to empower them with our $5,000 Back to School Giveaway! Nominating is easy: Just submit your favorite school by September 15. You can enter as often as once a day in that window, and sharing the contest on social media will increase the chances of your school winning. If your entry is picked in our random drawing, you’ll even get $250 for nominating! Check back on our blog after September 21 to see the winner. In the meantime, you can help your school during back-to-school season by creating a school supply wish list for easy donations. Genius!